Are you checking out ASU? 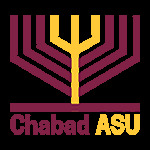 Rabbi Shmuel and Chana know many students and faculty memebers, at both the undergraduate and graduate levels at ASU. We'd be glad to help you get acquainted with the many great oppurtunities ASU has to offer and to assist you in your stay in Tempe. We can also arrange for you to meet present students at ASU, so you can hear about their wonderful experience here. Please contact us at info@chabadasu.com for more information, and so that we can set you up with a peer student to help guide your choices in picking the perfect place for you.